The folders are perfect to store all documents. With pocket folder inserts. The folders are screen printed designs. You will enjoy storing your documents. Dimensions:- H X L X W = 32 X 23 X 2.0 cm. This 100-page volume contains white hand-made paper. The cover is hard-bound with beautiful black handmade paper. Each book has screen printed with off-white rhino print. The binding is side-sewn with white linen waxed thread. The back cover has the bluecat paper logo. Minimalist and stylish grey black paper mache box file holder with stone finish. Discover our unique and beautifully screen printed selection of File Folders. Perfect to organize your files, stationery, and office supplies. Paper mache white file holder is carefully printed with grey design to brighten up both your office and home. Light grey table mats, medium grey and peach tamarind leaf print. Set the table with these gorgeous deckle edged place mats made from handmade paper. Green table mats, sky blue and medium grey tamarind leaf print. Smoothened and coated with natural bees wax to prevent staining , wear and tear. Screen-printed with water based inks. 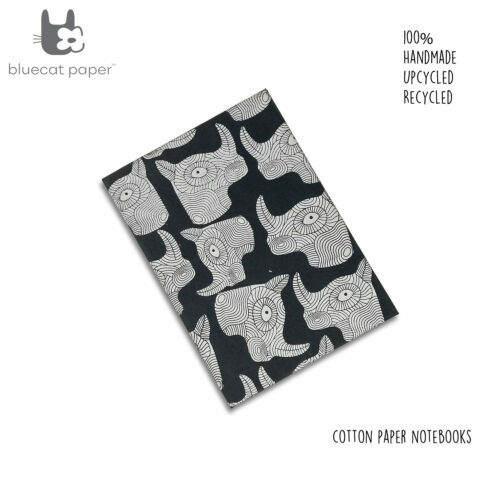 Designer book with fine cut light blue cotton papers. Hand sewn with Coptic binding. A wraparound red with sky blue dandelion print hard board jacket, with an attractive binding option. 160 pages of light blue fine cut papers. Coptic bind hard bound book, light blue fine cut cotton papers, red, sky blue dandelion print, 160 pages. This accordion book makes the perfect gift! Get creative, make a collage, a painting or an album for someone special. The books are hard-bound, making them sturdy enough to stand up for display. The book measures 12 x 16 x 4 cm. Four sets of accordion folded pages. Each set folds open to reveal 18 pages. Cover measures 12 x 16 cm and pages measure 11 x 15 cm. A6 size journal – perfect for your handbags and to take along with you in your pocket. 160 pages of white fine cut papers. Each journal is lovingly hand sewn by our skilled artisans. Coptic bind journal with light pink jacket, grey zigzag circle print, white papers. 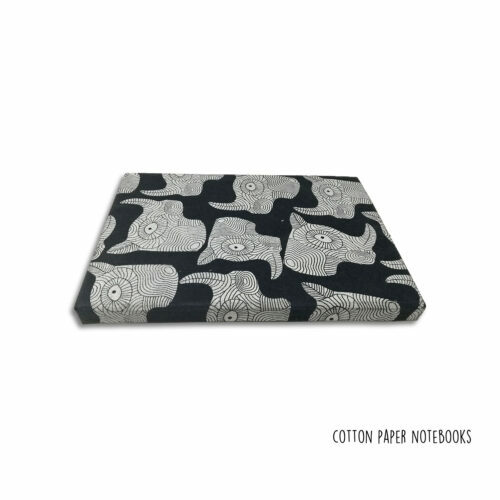 Coptic bind journal with dark grey jacket, off-white lines circle print, white papers.